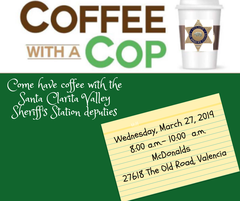 The Santa Valley Sheriff's Station is holding a “Coffee with a Cop” event on Wednesday, March 27, 2019 from 8:00 a.m. to 10:00 a.m. at the McDonalds located at 27618 The Old Road, Valencia. We hope you will join us for this opportunity to get to know some of the deputies who work in our Crime Prevention Unit and who help keep this beautiful community safe. Coffee with a Cop is a national initiative that aims to advance the practice of community policing by opening communication and fostering a greater understanding between citizens and law enforcement. The idea is to provide residents with an informal setting to meet deputies that work in their neighborhoods and talk about their concerns. The goal is break down barriers, build lasting relationships and familiarize the public with people who are there to protect and serve them. LA Crime Stoppers: Partner to prevent or report crime by contacting your local Sheriff’s station. Or if you prefer to provide information anonymously, you may call "Crime Stoppers" by dialing 1-(800) 222-TIPS (8477), use your smartphone by downloading the “P3 Tips” Mobile APP on Google play or the Apple App Store or by using the website http://lacrimestoppers.org .